As one moves up in the hierarchy of the managerial positions, the responsibility increases. The fundamental functions of a manager such as planning, organizing, leading, controlling and decision-making are the skills required to be mastered by the managers. In order to exercise these functions, one has also to keep in mind, the type of job, the size of organisation, the skills and experiences of the people one works with and the time available at his disposal to do these management functions. 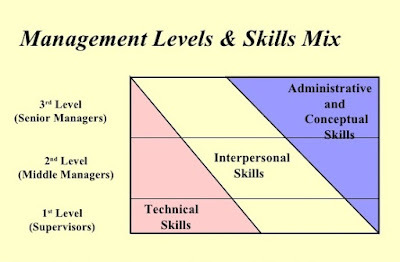 Katz (1974) talks of three types of skills that are recognised by all managers. These are the technical, the human and the conceptual skills. The use of these skills differs for various levels of managers. Let us understand the skills first and then see how much each skill is used at various levels of managerial hierarchy and what importance each has in the career growth of a manager. It is the ability to work with resources in a particular area of expertise. A surgeon must know how to do surgery. An accountant must know how to keep the accounts. Without the technical skill, one is not able to manage the work effectively. The first line supervisor in a manufacturing industry need greater knowledge about the technical aspects of the job compared to his top boss. In a small manufacturing organisation, even the top boss who owns the company needs to know a lot of technical skills. You will appreciate that technical skill implies an understanding of, and proficiency in, a specific kind of activity particularly the one involving methods, processes, procedures or techniques. It is relatively easy for us to visualise the technical skill of the surgeon, the musician, the accountant or the engineer, when each is performing his own special function. Such functions involve specialised knowledge, analytical ability within the specialised field, facility in the use of tools and the techniques of the specific discipline. In an age of specialisation, technical skill is perhaps the most familiar one, required of the greatest number of people. Katz pointed out that mostly the vocational and onthe- job training programmes are concerned with developing this specialised technical skill. In your desire to become an efficient administrator, particularly at the first level, this skill becomes indispensable to efficient operation. As a supervisor of a set of workers, you would .like to ensure if your workers have sound grounding in the principle, structure and processes of their individual speciality along with actual practice and experience during which your workers are watched and helped by you as a superior. This appears to be the best way to develop the technical skill. A workshop superintendent knows how to ensure that his technician is well equipped with the technical skill required for the work. An office superintendent ensures that persons working with him are having adequate technical skill for typing, shorthand, preparing draft etc. for doing their job. Quite a lot of training programmes for equipping the people with technical skills are going on all over the country in industries, hospitals, banks and educational institutions. As you move up in the managerial hierarchy, perhaps this skill becomes relatively less important than the human and conceptual skills. In a relatively small organisation, where you yourself are the owner and at the top management level, you need a lot of technical skill yourself. Human skill is the manager's ability to work effectively as a group member and to build cooperative effort within the team he leads. Every managerial level requires managers to interact with other people, whereas technical skill is primarily concerned with working with things (processes or physical objects). The first level manager is involved on a regular basis with the personal problems and life events of many nonmanagers. It is therefore natural that he or she must be able to work through these personal situations and effectively lead subordinates. He or she has to perceive and reorganise the perception of his or her superiors, equals and subordinates and his or her behaviour subsequently. If you have a highly developed human skill and if you are aware of your own attitudes, assumptions, and beliefs, about other individuals and groups, you are able to see their usefulness and limitations. And you are likely to accept others' viewpoint, perceptions and beliefs, which might be different from yours. Your human skills will help you to build a work atmosphere of approval and security, where people working with you as subordinates feel free to express themselves without fear of being ridiculed and to participate in the planning and carrying out of those things which directly affect them. You feel sensitive to others' reactions to your actions and you will act after taking others' perceptions into account. Your human skill thus becomes a continuous and natural activity with you so that whatever you say or do (or leave unsaid and undone) leaves an effect on your associates. Perhaps your true self will be seen through by others. In order to be an effective manager, your human skill must be naturally and unconsciously developed, as well as consistently demonstrated in every action of yours. For example, you want to boost the output of a production unit in an industry by introducing a conveyor system. You must keep in mind how to make your subordinates accept the situation of top speed production through this system with which they were not familiar earlier. You must also make sure that the person whom you place in charge of the workers or operators, is acceptable to them in creating a right attitude towards this conveyor system, towards the production goals (how much output per day to be produced) or what standards of production have to be attained. These are the human factors in production which cannot be ignored. Introducing computerisation in a large office setting which has a number of users to interact with; may create problems in the beginning as it amounts to increasing the efficiency in output with a relatively lesser number of persons. If you have to introduce the system, you may like to talk to the persons about its outcomes in terms of increased efficiency, gearing the skills of people towards various activities of feeding the data to the computer, maintenance of the computer data, etc. in order to make them appreciate the introduction of a new system. Creating the right kind of attitude and absorbing a number of people for similar skills to take care of a special and large number of users of the system can reflect your ability to deal with people. The most important single skill of a manager is to have the ability to deal with people. This is a challenge to your human skill, especially in the context of our country, with a vast number of people waiting to be absorbed in jobs, more so when we are planning to computerise the administration in various work sectors. The human skill can be developed without any formalised training for some. Many others to be individually aided by their immediate superiors who themselves should possess the human skill in order to be able to impart that. An important part of the procedure is the self-examination of the individual's own concepts and values which may enable him to develop more useful attitudes about himself and about others. With this change in attitude, there may also develop some active skill in dealing with human problems. You as a superior may like to observe your subordinate's ability to work effectively with others. You may probably improve your own human skill of rating people for their effectiveness as you become more experienced in this art. This skill means the ability to see the organisation as a whole and it includes recognising how the various functions of the organisation depend on one another. It also makes the individual aware how changes in any one part of the organization affect all the others. It extends to visualising the relationship of the individual business to the industry, the community and the political, social and economic forces of the nation as a whole. Thus the manager gains insight into improving the overall welfare of the total organisation. As a manager you should have the ability to coordinate and integrate a variety of factors. You need to view situations and determine the inter-relatedness of various factors. The success of any decision depends on the conceptual skill of the people who make the decision and those who put it into action. For example, you are trying to introduce some change in the working policy in your manufacturing organisation. It is very important to know the effect of such a change on production of goods, control, finance, research and people involved in these processes. Finally, it is equally important right down to the last executive who must implement the new policy. So at every level of the management, no matter which level you belong to, you have to recognise the overall relationships and significance of the change in order to be an effective manager. The chances of your success as a manager are greatly increased. Look at the organisation as a whole and try to understand the interrelationship of its parts while introducing a change in policy. Introducing a change in marketing policy of your goods, for example, will require to see the effect of this policy on all the factors under input, processing and output aspects of the organisation. Your success as a manager heavily depends on your conceptual skills or creative ability to perceive and respond to the direction in which the business should grow, organisation's objectives and policies and stock holders' and employees' interest. You can, by virtue of conceptual skill, be in a position to change the way of doing business in your organisation compared to another. Although it sounds as an abstract thing, one can try to develop the conceptual skill in many different ways. You may like to coach your subordinate to develop his managing potentials. Give him or her a responsibility and see if he or she asks you questions or seek your opinion. You may like to answer his or her queries in response to such searching questions. Of course, a lot depends on your interest and willingness to help your subordinate. Yet another way is to rotate your subordinate on various types of jobs which expose him or her to different functions of the business, but at the same level. This is to say, one can, for example, be put in commercial job for sometime dealing with sales, again on production job, observing the process of production on the shop-floor and taking part in it if needed. You may like him or her to experience a bit of design aspect of the product, which gives him or her insight into the research and development activities. In most of the leading private and public sectors, job rotation is a significant part of the young and promising graduate's apprenticeship training programme. This gives him a chance to be "in the other fellow's shoes". You may also like to involve your junior to advise you on policy matter. Some real problems can be posed to make your subordinate understand broad management policies and inter-departmental coordination. Like human skill, conceptual skill must be a part of the executive's make-up of the personality. Different methods may be used for different people suiting their background and experience to develop their personal skill in viewing the organization as a whole system and coordinating and integrating its different parts. Conceptual skill compared to technical and human skills is more important at the top level of management. At the first level, one has relatively few factors to consider. Technical skill is responsible for many of the great advances of modern industry. It is indispensable to efficient operation. It has the greatest importance at the lower level of administration. As the manager moves up in level, the need for technical skill becomes less important, if he has skilled subordinates to help them solve their own problems. When the manager reaches the top, technical skill may not be existent, but with a highly developed human and conceptual skill, he or she may still be able to perform effectively. Human skill in you is required at every level, but with difference in emphasis. If you are a foreman, your chief function is to attain collaboration of people in the work group, with whom you have direct contact. If you are a middle level manager; your human skill is utilised for facilitation of communication in the group. At the top level, these personal contacts decrease and the human skill in you is used less and your conceptual skill becomes increasingly more important with the need for policy decisions and broad scale action. You start considering the environmental forces, the resource flows, and the functional managerial skills such as planning, organising, leading, controlling and decision-making. If you happen to be capable and alert, perhaps you can make out a kind of built-in sense of dependence of employees on superiors and use it to your advantage. Sinha (1980) has shown how in Indian context, the leader nurtures the subordinate, by creating in him a sense of dependence on the superior Such kind of dependence adds to the productivity of the workers, provided. the superior is consistent and predictable in his behaviour. For example, you may have. observed that there is superior, who really recognizes the inter-relationship of all the activities under his control, identifies himself with the organisation, sublimates the subordinates' interest to his interest, sets his goals realistically and shows his subordinates how to. reach this goal. Managers at all levels require some competence in each of the three personal skills. Even, managers at the first level must continually use all of them. To briefly state it, the top level manager uses the conceptual skill to deal with environmental demands on his organisation. The limited physical and financial resources available to him make him effectively use his technical skill. The capabilities and demands of the persons with whom he deals make it essential that he possesses the human skill. You may like to appreciate the skill mix by management level. Now that you are familiar with the skills of a manager, we would like you to know about the institution-building skill of the top executive. In the position of a manager and with your technical, human and conceptual skills; you will appreciate the fact that along with efficiency of the organisation you are also equally concerned about achieving better satisfaction of employees, their welfare, their development which might create an-impact on the society and their morale. On the other hand you may be interested to achieve as well as maintain your position of a leader as you move up to the top level of the organisational management. Hence, you can make your organisation effective, if you can achieve all that you set as goals for your organisation as mentioned above. This requires a kind of managerial skill that helps in building an institution or organisation. Pareek (1981) assumes eight main roles of the top level executive, which are required for institution-building. i) The very first role is the identity creating role of the top level manager. You create a special place for your organisation by making it unique in one or more than one respect. You may have good employee welfare measures that make your employees happy. You may also be known for your technological innovations and users of your technology outside your organisation are happy about it. Thus, you are known with your identity with the above two areas which are created and you have also made or established your organisation's identity that way. ii) The second role is the enabling role of the top level executive. Your job here is to develop various kinds of resources such as men, material, facilities for work as well as a good work atmosphere. Your men can be trained and updated in their skill. Your materials or inputs as well as outputs can be multiplied. You can even give employees a very challenging as well as satisfying atmosphere to work by knowing their ability as well as willingness to work. You can certainly improve their efficiency as well as morale. iii) The third role of the top level person is the synergizing role. You may feel that you have to multiply your resources-both human and material, to achieve the goal of your organisation. Collectively these resources can contribute to the goals of the organisation. It means much more than mere aggregate of men or material or money. It means proper utilisation of men, material and money, particularly when such resources are scarce. This role of the top executive is a challenging one, as he or she has to uniquely combine resources with their maximum utilisation. iv) The fourth role is known as the balancing role of the top executive. Your role as a manager is to make your subordinates conform to rules, expectations, regulations or procedures if you have to achieve the goal of the organisation. Such conformity may not be so much stressed that it destroys the creative potential of the employees. How can then the organisation grow? Allow your people to be creative to be able to move in new directions and respond to the new challenges and pressures from the environment. Thus, a balance between the conformity and creativity should be maintained by you. The organisation can stalbilise its work processes and people to achieve the result as innovations are made by the people to move in new directions. v) The fifth role of the top level executive is the linkage building role. As a top manager, you have realised the social obligations of your organisation to the benefit of other organisations as well as the community and society at large. You may like to link your organisation with other technical or financial organisations or government agencies or policy making bodies who may have similar goals like yours. For example, your research and development unit of the industry can have link with a similar unit in educational or research organisations. You may also like to get support from financial institutions to develop your research and development activity. You may like to link your activity with the community where you work. A rural development centre's activity at a technical education institution can be very well linked with community development programmes in rural areas on issues like health, sanitation, education, etc. vi) The sixth role of a top executive is the futuristic role. You may like to expand or diversify or change or reorganise your organisation for meeting new demands and pressures. You should be prepared for the importance of the role your organisation can play in future. vii) Making impact is the seventh role of a top executive. This means making an impact of one's organisation on others. A leading manufacturing organisation of a product can be very influential in several ways to influence the policies in the field in which it operates. Examples of electronic goods such as television, transistors, calculators and computers are not rare, where superior technology in the manufacturing process is ever on the increase. viii) Last but not the least is to provide superordination to the employees working under a top executive. You can done by giving a sense of fulfillment to the members of your organisation by building in them a sense of pride that they are working in a very important field of working, which is so important for the society. For example, members of a fertilizer or oil or steel organisation would be very highly motivated and satisfied people as their work is of importance to the society. This sense of pride has to be brought out by you as a top manager. You might have liked various roles that a top person in the management plays to build an institution. Most of the institution building activities require the top person to attend to some very important functions. 1. Building an efficient and strong team of people at the middle management level so that they can really work for him and the organisation. You as a top person can always encourage some persons to learn some of your management as well as managerial skills to keep the organisation functioning by their strong and mutually supporting activities. 2. You may like to monitor and review the functioning of the organisation at different time intervals to ensure correct way of functioning. You may also make sure that your team of people are open to problems of their own group as well as appreciate problems of similar kind occurring at various levels in other organisations. Many times we are successful in resolving our problems concerning people or their work by borrowing experience of others. 3. You may like to search for competent people at all levels and reward them for their competence and dedication. Your search for competence is a significant way to enhance the competence of your organization. 4. As a chief executive, you have to keep in touch with and share ideas with policy makers and planners as well as intellectuals who bring in deep insight to understand and plan for the future. You may like to join meetings and debates of such nature which will make you think about your own skills in this regard. 5. You may like to develop in yourself a kind of skill to be involved with the organization yet remain detached about it. In India, this sense of remaining detached, yet knowing what is happening is one of the very important work values existing in our culture and tradition. You may be deeply involved to become a very effective top person in the day-to-day operations of the organisation and its results. Yet you should also be detached from people and situation to observe your own activities and experiences to learn about a different approach to your organisation.